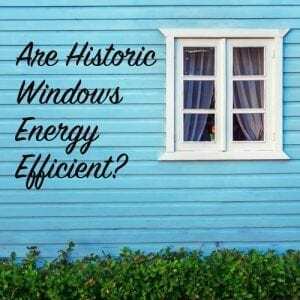 Are Historic Windows Energy Efficient? This week, we’re on to claim #2 of mine that is so often refuted by energy gurus, developers, and the replacement window industry. I’m going to take a wrecking ball to these ludicrous claims in this post, and in the next 10 minutes, show you irrefutable proof that an energy efficient old window is not a unicorn story spun by historic preservationists. An energy efficient historic window is a very real and very attainable thing that can be accomplished by minimal upgrades to the original window that cost far less than replacement. You see, the reason this one gets me so riled up is because windows are by far the most endangered pieces of historic buildings. They are being torn out and thrown away in the name of energy efficiency at a rate of over 30 million a year. The replacement window industry has done extensive testing and knows the facts about their products. They know that the windows they are selling are engineered with obsolescence in mind. They can market them as energy saving because initially they save energy over a neglected, un-weatherstripped original window even though, cradle to grave, they use way more energy. In fairness, almost anything would save lots of energy compared to a beat up neglected old window (even an $8 sheet of plywood would!) so it’s not a high bar to beat. What they won’t tell you is that a restored and weatherstripped window will save more net energy than a new replacement window. They convince you you have a problem: The problem is two fold, your old window is drafty and inefficient, your old window requires maintenance. That appeals to the two most powerful marketing triggers to all humans, time and money. They offer you a single product (a window) that solves both of these problems! Cut your energy bills and never have to maintain that window again. Amazing right? Wrong. They promise you their product has a “liftetime warranty” which it does, but only on “non-glass materials”. They don’t tell you about the 10 or 20-yr warranty on the glass. That is buried in the fine print which only dorks like me dig up and share with smart readers like you. A warranty is only as good as the weakest link, and their lifetime warranties don’t stand up to scrutiny because they are technically only 10 to 20-yr warranties, due to the fact that if the glass fails, then the only solution is to replace the whole unit. Maybe at this point you’re thinking “Hey even 20 years is not a bad warranty.” They aren’t done with their dirty little tricks yet! That 20-yr warranty only covers materials, NOT labor, after only 2 years! Here’s a little excerpt from Pella’s Warranty on vinyl windows. If you want a little more naked truth about their “lifetime warranty” on “non-glass materials” keep reading! The US Census Bureau reports that Americans move approximately 12 times in their lifetime. If the average lifespan is 79 years (which it is in 2017) then that means, on average, we move every 6 1/2 years. What does that have to do with the “lifetime warranty” though? Well, to use Pella again, that “lifetime warranty” is non-transferrable. That means that as soon as you move, those windows are no longer warrantied and ripe for full price replacement as soon as they fail. Pella isn’t stupid. They know these figures, and while they will honor a lifetime warranty on vinyl windows for the handful of people who live in their house for 20+ years, they know that most of their “lifetime warranties” will only have to be serviced for about 6 1/2 years. And anyone can make a window that can last that long. And it’s not just Pella, it’s all the major window manufacturers who play this game. You can read more in my post Replacement Windows: The Real Story. But, let’s get back to the question at hand. For the answer, you don’t need to listen to my opinions or the marketing hype from the replacement window industry. You need cold hard facts, not salespeople, so, here they are. In 2011, the Window Preservation Standards Collaborative, a group of window restorers from all over the country, got together for their first summit to discuss this very topic. They had a hunch that historic windows were more efficient than the replacement industry was saying, but no one had ever done definitive unbiased testing. The testing was performed by a third party certified by the Building Performance Institute, according to ASTM E1186-03 (2009) standards and the findings were astonishing! There were 5 different levels of efficiency upgrades tested and all of them exceeded to 2009 IECC energy requirements for windows. More than that, all but one exceeded the current 2012 IECC energy code requirements! If you’re not a believer in numbers and facts, then there is very little I can do for you, but this round of testing was the final nail in the coffin for replacements windows in my opinion. 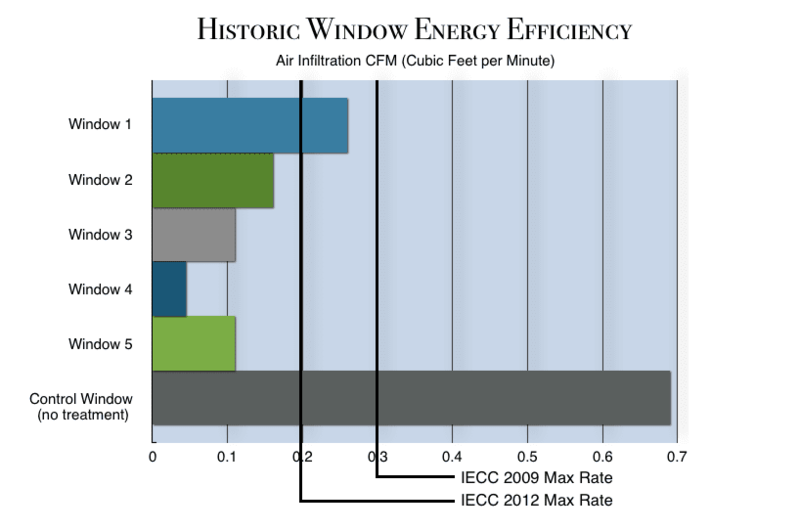 This shows that historic windows are indeed energy efficient. Not to mention that you don’t have to worry about 10, 20, or even 30-yr warranties with historic windows. They have already lasted 80, 100, 120+ years and they will continue to last another century with minimal care. If you want to learn everything from the basic to advanced techniques for repairing, restoring, and weatherstripping historic windows, you can visit my resource page How To: Repair Old Wood Windows. I am trying to find information on how to make old casement windows more energy efficient. I have a customer who wants to replace the glass with thicker glass to accomplish this. I’m not sure this will be effective. 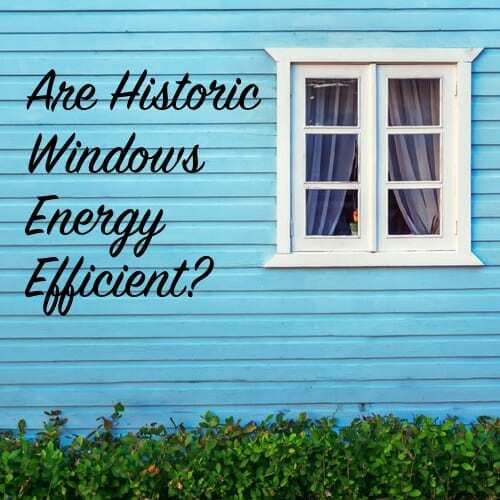 Do you have any information on making old casement windows more energy efficient? Thanks for all you do! Thank you for this great article. I’ve often wondered about what to look for in windows and look forward to reading the next blog on this topic. We are adding an addition to our hundred year old house and were planning on reusing some of the original double hung (with wood storms) windows from the wall that is being bumped out. Well the city is claiming they will not let us do this, since the windows are “single pane” and “not energy efficient”. We are planning on fighting this, and I was hoping you could supply me with a link to the actual Building Performance Institute study so that I could possibly supply it to back up my case. Thanks! I have to respectfully disagree with the consensus. As an owner of an 1814 farm house fixer upper, I’m currently replacing the windows. I am trying to keep the look of the traditional build of the house and it is tasteful. But just a few of my thoughts. The craftsmanship the original builders put into the house was amazing. The jambs, sill and header are in relatively good shape and I was quite impressed on how they built the frame. The exterior casing is original but is pretty rotten in many area and stripping and scraping will just spread more lead dust everywhere. Really not worth saving. The sashes have beenextremely neglected by the previous owners. I understand I could repair them and replace the metal storms with nice wood ones. I decided to pay a small premium on Harvey wood replacements that are aluminum clad on the exterior. Even though it pains me to remove the entire wood frame of the old windows, I don’t really regret it. As I removed the siding and old frame, there was a severe void of blown in cellulose all around the jambs, sill and head. The replacement glass in the new windows is amazing and makes the landscape look much more vivid compared to the old windows. The old sashes were two over two which broke up your field of view. So I went with a two over one sash. The top sash is also fixed in the original windows, which I’m not a fan of. And finally the biggest factor, my girlfriend is pregnant with our first child and the sashes are full of lead paint. That was really the deal maker for me, considering that the certainty of no lead being present in a moving part of the house that my kids will be touching for years. All in all, I feel sad removing the old windows, but the new windows are really beautiful and are worth the money. I couldn’t agree more with you! Just to play devil’s advocate, where are the charts to compare the efficiency of historic vs vinyl or other replacement options? This testing compares the air infiltration which is the key to energy efficiency. The glass can be changed easily in order to get a better U-factor if need be for better efficiency. And after those two changes you can easily surpass replacements. That doesn’t even take into consideration the almost unlimited lifespan if maintained properly. This is a very interesting topic, indeed. As a replacement window company in San Diego, we find that we are replacing mostly aluminum frame, single pane windows from the middle of the last century. Many of these products are failing their homeowners, and replacement really is the best option. I agree with you that well-cared-for, wood windows in historic homes can be very durable energy efficient, and should not be replaced, but for homeowners with cheap, aluminum windows that are beyond repair, high quality vinyl windows really are an upgrade when it comes to both energy efficiency and operability. We sell windows from companies like Anlin Window Systems, which has a double lifetime warranty (transferable to the subsequent homeowner) and covers the glass for a lifetime, as well as any labor. If you go the window replacement route, you really need to do your homework (the Pella warranty you cite is a good example of the importance of this). As the owner of a 1906 American Foursquare with 35 original windows, I have to disagree that the windows are energy efficient. As much as I try to keep things original, my house was always cold in the winter from the time we bought it 23 years ago. Over time, I have replaced all the windows and the front and back doors, and my house is much warmer in the winter. Before my husband would need a sleeping cap for his bald head and our noses would be cold. Now we keep the house at the same 60 degrees at night and 68 degrees during the day and we are comfortable. I don’t want to be wasting money and energy resources to blast the heat because it’s escaping out the windows. For us, replacing the windows was the best course of action. Tina, left alone an original single pane window is not efficient. But restored, weatherstripped and with the addition of either an exterior or interior storm it is actually much more efficient and vastly longer lasting (the real key!). Replacement windows can’t compete with the length of service you’ll get from an original window. Comparing apples to apples they are more efficient. They were never meant to be efficient without the weatherstripping and storm. I totally agree. There’s not a window in my house that’s less than 100 years old. I’ve got a couple that are probably 150 years old. I spent 2 entire spring and summers restoring windows including duplicating mill work on a router/milling machine, They’re weatherstripped,with exterior storm windows. I live in Michigan, there can be a howling blizzard outside, but there”s no draft coming into the house. I have an 1890s Victorian with all original wood double hung windows in Michigan. All of them have aluminum triple track storms, which obscure the double hung appearance of the window from the outside. I’d like to remove them all and slowly add in wooden storm windows over the next couple of years as the aluminum storms really detract from the historic look of the windows and are otherwise just ugly. All of them have been restored with new glazing, paint, sash locks, and spring bronze weather stripping. What are your thoughts on removing them? Will I see a significant reduction in their energy efficiency? This is quite an interesting topic Scott! My wife and I are restoring an 1868 Farmhouse. At some point someone replaced all the original beautiful radius top windows with standard square windows. We have 28 windows and want to eventually replace these windows with radius top (arched) windows. I wish we could find the original windows but that’s unlikely (there’s one in our garage). Any suggestions? Is custom our only option at this point? Custom is really the best option. Try wood window makeover for historic replacements. Yet another way new isn’t as good as the old. Plus the old are a whole lot easier to fix. Too bad basic window repair knowledge seems to be a dying art. I appreciate all you have done to make this information available to homeowners. I just wish the hired handyman types knew this stuff these days, unlike their Dads and Grandfathers. Kathy, Ken’s website at Old House Guy is great! Glad you found him too! Hi Scott, we are restoring a 1916 bungalow that has a craftsman style porch. Very plain inside. A 63 foot long hallway with four rooms along each side. We have had the pier and beam foundation redone as some of the original cedar stumps were here but not really supporting anything; a new galvanized roof (probably not what was on here in 1916 but was very old,; refinished the long wood yellow pine floors; removed some of the wallpaper covered and painted paneling which has shiplap underneath-to included the ceiling; had all PVC replaced with PEX; and, now we are starting on the outside. We were going to replace the water board and cap all the way around the house but after reading your blog and reexamaning the board decided that there were only a few small sections of the wood that were actually rotten (due to a handicap rail being badly installed). So, now it will be mostly a preservation project with about 80% of the original wood to be saved. We still have 33 windows to open and re-rope and an entire house of paneling to remove. We were going to remove a few walls to create an open floor plan but after living here for almost a year we have grown fond of the house in the original configuration and can’t seem to bring ourselves to “mutilate” the interior. No, we don’t have a gorgeous new house with smashing hard wood floors and granite countertops, but, we have a house we love and thanks to your inspirational blogs, one we can work on to restore and preserve both inside and out. It would be great to reprint portions of your blog in our town’s Preservation website; if I can get my foot in their door. Please advise if that is possible and how the credit should be written. Thanks for all you do. Billie, I’m so glad you’ve enjoyed the blog! I’m happy to share anything you want on the blog just cite the source. Keep loving that old house! Glad to hear the you are keeping the original configuration. There are many advantages to “closed” floor plans, and it is so much cheaper to keep the original than ripping out walls and putting in support beams. Perhaps a scaled down version is possible to reduce the long hallway a bit or widen openings between rooms. Your house may already have the columnades and pocket or French doors that period homes used to create openness yet separation between rooms. Unfortunately no pocket doors. One French door was here in the 50s and opened the hallway into the first room on the left which is across the hallway from what we believe was the formal living, or sitting, room. A previous commercial resident cut a second French door between the formal living and what was used as a dining room in the 50s. We are also using it as such. We do have to continually move doors around as the house moves and a door that closed in one doorway today will have to be moved to a different doorway next month. It is very entertaining.